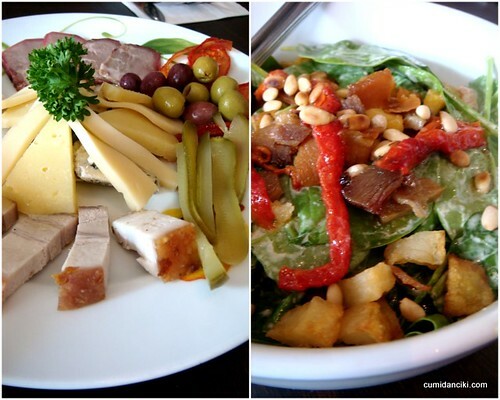 Weekend are the best for relaxing, catching up on blogging, reading.. oh yea, and eating too! This weekend the owners of Karl’s Beisl invited us via Pureglutton, along with several other Food Bloggers, to a review at their restaurant. The Cuisine of Austria, which is often incorrectly equated with Viennese cuisine, is derived from the cuisine of the Austro-Hungarian Empire. In addition to native regional traditions it has been influenced also by Hungarian, Czech, Jewish, and Italian cuisines, from which both dishes and methods of food preparation have often been borrowed. Goulash is one example of this. Now a days, a modern, new cuisine has developed which employs modern and easy methods of preparation. “Beisl” in Austrian means a bistro, beer house or a cosy restaurant. These European restaurants serve “a few of my favourite things” (rain drops on roses and whiskers on kittens!) 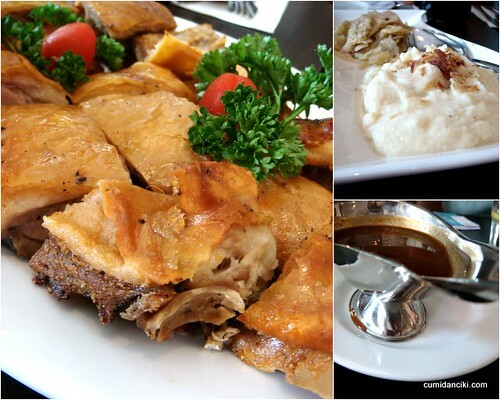 traditional roasted pork knuckles, suckling pig, grilled meat, seafood dishes and Austrian home styled cuisine. Hearty food, great mellow beers and a nice friendly vibe is what you will find, dining at Karl’s Beisl in Solaris, Kuala Lumpur. Let me just say that not all salads are created equal and some are downright disappointing. For something as simple as this green side dish, you would think it would be easy to toss together. Too many restaurants have bungled my vegetables by drenching it in too much sauce and making it unpalatable. The starters we were served of Spinach Salad with red Peppers, Bacon Strips & roasted Potatoes were fresh and light and a total delight to eat. The crunch in those massive, sweet spinach leaves will be the one to top, in future salads, for me, I think. The Cold Platter of Serrano Ham, Chorizo, Pork Belly, Olives, Cheese, roasted red Peppers, Gherkins and Sun dried Tomatoes eaten with a Baguette was as delicious as it was pretty. I loved the play of colors and flavours on that plate. Please note that Karl’s Beisl has their own smoking machine and they make their own smoked meats. Superb flavour and texture! 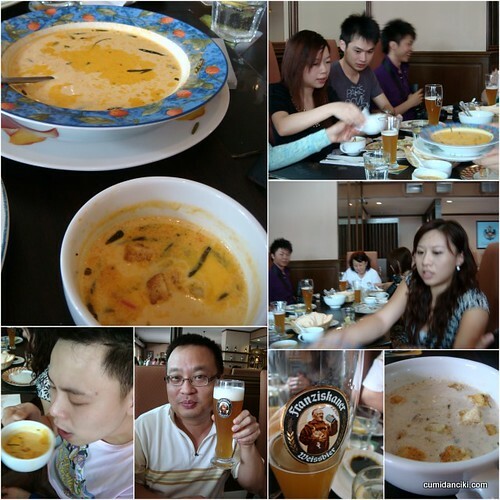 I am talking about the beer.. and the soups too of course. I have to say, I’m not much of a beer-head due to the calories that come with this alcoholic beverage (vs. wine or spirits) but I will agree to the odd pint if the situation arises. When it comes to the bitter stuff, I’m a bit of a wuss and I get tipsy really easily. However the Germans have great beer, I like the blonde ones ( blonde wheat-beer I mean!) they tend to be smooth, creamy and sweet. Totally suits the tender tastes buds of one such as me! The German beer on tap at Karl’s Beisl is great – you must try it. Of the two soups were were served, the Cream of roasted Red Pepper and Garlic, with Rosemary and the Cream of Forest Mushrooms, the Cream of Red Peppers won, hands down. Both soups were superbly creamy and dense with ingredients but the fresh rosemary in the cream of peppers really shone through, adding a special twist and surprise to each mouthful. Explosions of herbal flavours to taunt your taste-buds for the next dish. Next, we were introduced to the house specials. The Roasted Suckling Pig can be ordered as a whole or as a half. The crackling on the suckling pig served here is impeccable and the flesh as pale and sweet as you would expect from an animal with so little experience of life. I never knew what the hell the crazy sod was talking about. Until I ate Pork knuckle with sauerkraut. Admittedly, Asia is home for me, not Europe, but after sinking my teeth into this hearty dish for the first time, I get what the guy means by “that taste of old home”. It just tastes like the comfort of being at home. Spot on Mr. Lecturer. The Pork knuckle platter aka the Farmers Platter at Karl’s Beisl is made up of a combination of Roasted Pork Knuckles, Bratwurst, Frankfurter Sausage, Pork Belly and Kasseler Ham served with Steamed Cabbage & Mashed potatoes. Of course you may choose to have your’s with Sauerkraut like I did (and old Hans would approve!) and it would be simply divine. Really, the taste of old home. The Farmers platter comes as a Standard that feeds 3 to 4 persons or as a Jumbo size that feeds 6 to 8 persons. 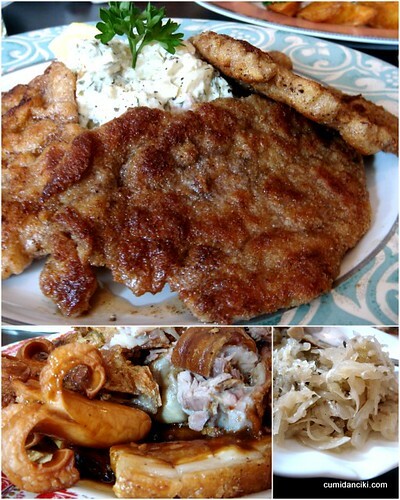 More pork in the form of a Pork Wiener Schnitzel, served with Potato Salad and this was a winner as well. The schnitzel was moist on the inside yet crunchy on the outside. The meat was extremely tender. I really dislike dried out, hard schnitzel. This one was good. 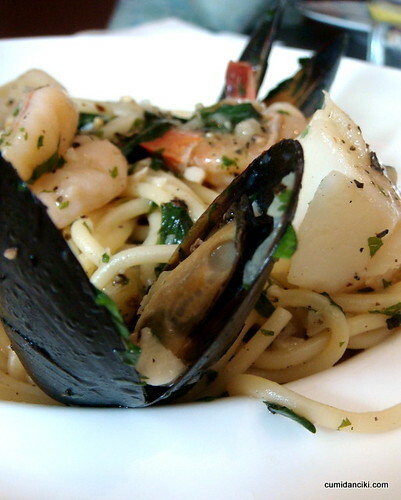 Sea Food Pasta in White Wine, with Scallops, Prawns, Squid, Mussels – fabulous al dente cooked pasta. I loved the wine notes that rolled around the pasta and enhanced the shellfish flavours. 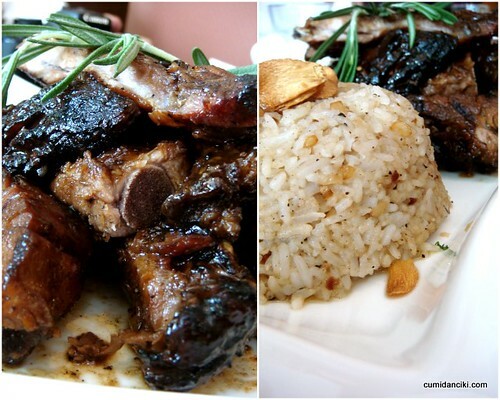 Pork ribs and garlic rice where our final mains and I was too full by then to fully appreciate anymore pork dishes! The last course of desserts were a pleasure to eat. 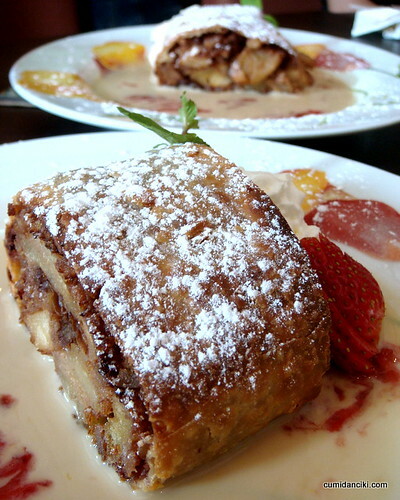 The Calvados Apple Strudel, with Vanilla Sauce was bursting with apples and had an intoxicating cinnamon flavour. I am told by Fatboybakes that it takes a heck of a long time making Apple Strudel, so be pleased and grateful when it is offered to you as a dessert I think! 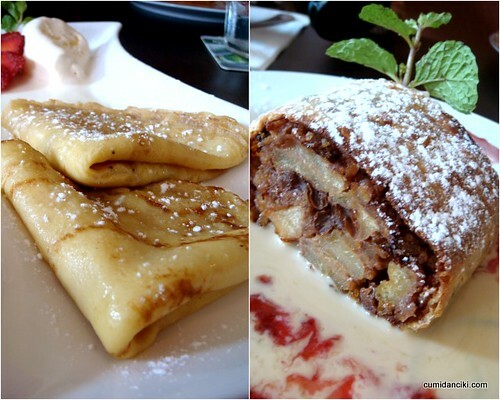 We also had the Palatschinken which was essentially crepes, with Apricot Jam, Rum & Raisin Ice Cream. Delicious. A fabulous end to the meal. I will definitely be back soon with Cumi, who was away today and unable to attend the review. I need to show him what ” that taste of old home” should be like! Next articleBrace your belly for Balut! Mmm…German Beer. Been to Solaris but never to this particular outlet. Missed the taste of old home – I imagine eating all of the above with intricate lace doiles and nasty granny patchwork decor, and enjoying it all to the max!! LOL, same here darling.. same here..
ai wei, nice to see you.. u look so pretty with the bow in your hair:) yea the food was inspiring so i blogged it fast, before i forgot the experience! have been following your blog for almost 2 years .. love it! Btw, were u in cold storage ytd? Look at monkey boy’s sexay soup shot! Panas! he is a pretty boy innit? u should have come! we missed ya! LOL, u r welcome to browse everyday! That’s a lot of pork for one meal. The food looks really interesting. I haven’t had much German food but one thing I agree with, German Beer Rules! seriously good stuff. thank u for stopping by the blog! yup2.. try the smoked meats.. awesome! eh .. look mum, i know KBCG! yay 🙂 yea, so hungry now.. feel like some german.. AGAIN! LOL, i thought u loved your rice?! cool, i love salads too! great …awesome.. i like very much.. Fish Head… Pre-annihilation… FISH HEAD POST ANNIHILATION !!! THE PLACE : Bangsar Lucky Garden, Behind TMC… under a zinc roof top… UNDER a TREE…….